Things are looking good on the fishing front. The first “cool” front of the season pushes through this weekend and that should really fire up the fall fishing patterns. INSHORE- Take advantage of all the bait around inshore right now. The Intracoastal is a great spot to be looking for snook right now. Try fishing around bridges at night for really good results. Find a bridge with a good amount of current, light, and bait; and you will find a good number of snook and tarpon hanging around. The ICW up north towards Hobe Sound is full of assorted fish right now. Fishing the flats around mile marker 40-44 with some live shrimp will produce; snapper, sheepshead, ladyfish, trout, snook, jacks, and more. SURF/PIER- Surf fishing is great right now. All of the fall players are showing up, they are hungry, and ready to eat! Spanish Mackerel., Bluefish, Pompano, Sharks, and more are all around right now; and they are here in good numbers already! For those looking to travel light on the beach it’s time to break out the silver spoons and go to town. For the bait guys go with shrimp for the mixed bag action, sardines and finger mullet for the bigger stuff! It is a spectacular morning out at the Inlet. Tommy at the Inlet Bait & Tackle Shop said that there have been some BIG Spanish Mackerel caught, Snook, Reds, Flounder, Bluefish and Jacks. Most common bait used includes mullet and shrimp. Fishing seems to be picking up! Photo with a young anglers with a 27" slot Red and nice Black Drum. there were about a dozen Black Drum and a dozen slot Reds landed. Lots of finger mullet were in the water and anglers landed Blues, several Jacks, and caught a bunch of short Pompano that were fun to catch and release. Inshore, one angler reported catching a 6# mutton snapper fishing a live mullet at the north jetty at Ft. Pierce yesterday. Jack crevalle were busting up the mullet at the Pelican Yacht Club's docks, an annual ritual for this time of the year. Last night the inlet at Ft. Pierce was on fire again with tarpon, jacks, ladyfish, bluefish and snook. A few anglers caught slot size snook on the south side of the inlet using a black back windcheater plug. Redfish are roaming around the lagoon and you can catch them using a copper or gold spoon on the flats. It is crystal clear out at the Inlet this morning. The wind is blowing out of the West-Southwest at approx 4mph. Lots of Anglers are taking advantage of the mullet that is plentiful out at the Inlet, as the mullet is great bait to catch many species, including Snook. Good sized Black Drum where landed off the north beach using dead shrimp. Black drum bite continues to be solid inside the Sebastian Inlet with schools of clean fish working their way into the Indian River. If you are targeting live shrimp try using a live shrimp on a 1/4 oz. Mission Fishin' jig head. Redfish bite in the river continues to get better as the water clarity slowly improves. Expect this to improve if a cool front comes through anytime soon and larger schools of reds start pushing their way into the river. Mullet run has been in full swing over the past few days with finger mullet pouring in and out of the inlet. With all that bait, the snook bite has been solid for land based anglers over the past few days and just now starting to slow down as the fish have to be getting full by now. Croakers, which have been in short supply, live select shrimp, and big silver mullet have been the best bait during the day while a live pigfish has been working well at night. Expect the first cool front of the year to start moving the bait to our south and hopefully the snook bite will start to even out a bit and not be so hit and miss. Also over the weekend, spanish mackeral have made an appearance following the mullet. These have been really nice sized fish for the most part. Nothing works on spanish mackeral quite as well as a Gotcha plug. We have another beautiful morning at the Sebastian Inlet. Our anemometer has been fixed and winds are blowing out of the Southwest at 4 mph. Fishing was pretty slow yesterday with a few Jacks coming over the rails early in the morning, a couple of Ladyfish and 1 keeper Red, according to Mike. Around 6:00 in the evening the bite started picking up with keeper Reds being landed from the north jetty and the beach. The beach and inshore fishing has been fantastic. The mullet are coming down the beach and pushing in the inlet, and the snook, tarpon, big jacks, and sharks are getting with it. Fishing in the surf has been excellent as well and is giving anglers ample opportunity to catch big snook and even over-sized redfish on plugs. Up the river the trout fishing has been steady and we are still seeing some great schools of over-sized redfish. We are estimating the wind is blowing about 8 - 10 mph out of the south, our anemometer is down on the web cam and our weather station anemometer is flat lined as well. Hopefully we will have at least one up and running again soon. The water is calm with a light ripple. We received a report from inlet regular Mike who fished the north jetty yesterday and reported Jacks, Jacks and more Jacks in the early morning hours. The bait fish had thinned out yesterday but around 10:00 a.m. a flurry of Reds came through that included a bunch of keepers. Mike threw out his last live finger mullet and landed a 28.5" Red that had to be returned to the water. Several nice Spanish Mackerel were landed with a few huge Macs thrown in. Today a 36" Snook was landed while fishing from the beach on the north side of the jetty throwing plugs and was released unharmed. Inshore, last night the inlet was full of mullet and the tarpon were having a field day. The big problem is there are so many mullet, getting a jack crevalle, snook, or tarpon to take the mullet you are fishing with is 1 in ? Midday yesterday there was some good action to be found around the Pelican Yacht Club's docks for snook and jack crevalle. You basically have to be in a spot where a feeding frenzy takes place with all the mullet around. It is beautiful at the inlet this morning. Clouds are keeping the temperature down, winds are blowing out of the Southwest at 8 - 10 mph and there is a light ripple on the water. There is a good chance of rain today, so go prepared if you head to the inlet today. Over the weekend we had a good bite for Reds, Snook, Jacks and ones and twos of various other fish. Sunday night went off like a rocket and everything was biting according to Tommy at the Inlet Bait and Tackle Shop. Large schools of bait continue to swim around both jetties.A couple was fishing about halfway down the north jetty on the north side and landed some beautiful oversized Reds using finger mullet also landed a few slot sized reds, some Whiting and Pompano, some keeper sized and some undersized that were returned to the water. INSHORE- The mullet are still flowing inshore, and the snook and tarpon are liking the easy meals. Find the mullet schools and you will find the fish, its really that easy inshore right now. I still like lures in low light periods and at night, live bait during the higher light periods. While the snook fishing is the highlight inshore this month, others are around as well. Tarpon, jacks, and a few redfish are following the mullet schools as well. The local bridges are still holding a few mangrove snapper, sandperch, and blackdrum. Lastly on the inshore front, the toady cult is starting to move…you know who you are. Surf/Pier- The surf/pier fishing has been very good over the past few weeks. We still have good schools of bait around, lots of fish, and some nicer weather. While the bluefish are starting to show, they haven’t run everything out of town just yet. Snook fishing along the beach and at the pier is still good. The pompano are starting to show. Sandfleas, shrimp, clams, and Doc’s Goofy Jigs will be your top bait choices for the pompano. Bluefish and spanish mackerel will really start to fill in nicely over the next few weeks. Inshore, fishing inshore has been good over the past week for snook, trout, redfish, and jack crevalle. Snook fishing in the inlet last night was good with most of the fish taken on live mullet and a few on redtail hawk type jigs. Trout fishing south in the lagoon this week produced some excellent catches on gold spoons and soft plastics. Fishing for flounder off the south jetty early in the morning and after sunset has been good this week as well. There are a few tarpon around after sunset and we have heard of a few spanish mackerel along the beaches. It's a real pretty morning at the inlet. Winds are blowing out of the Southwest at 6 mph and there is a little chop on the water. Inlet regular Mike was out on the north jetty yesterday morning and reported an excellent morning bite for Snook, Reds and Black Drum. Live finger mullet and live and dead shrimp were the most productive baits. One angler landed several Reds and took home a 26 incher. Mike landed a 25" Red and three nice Black Drum, all on dead shrimp. Anglers had a great morning landing slot Red, three Black Drum and Spadefish. A lot of Sheepshead came over the rails but they were all short and returned to the water, only two of the Pomps were keeper size. This past week it was been all about the black drum. Black drum action has turned on like a switch in and around the Sebastian Inlet with many anglers reporting catches of nice sized fish in quantity. Live shrimp has definitely been the bait of choice and these fish are nice, clean ocean drum. The redfish bite in the river has also picked up recently although sight fishing them remains difficult with dirty water conditions that has slowly been improving. Because of the dirty water, if you can't see the fish try chumming up the water with cut mullet and/or ladyfish and let the redfish come to you. The flounder bite that has remained all summer long continues to be hot with regular catches of fish over 20" coming from the flats surrounding the Sebastian River (US-1) bridge. So far this month the snook bite at the inlet has been hit and miss with a hot bite one night and the fish gone the next. This should improve over the next few weeks as the snook start settling into the normal fall routine. A week cold front should help settle them down. Anglers fishing for snook during the day have had the best luck using live select shrimp and pinfish, while those fishing at night have been using Gulfstream Flare Hawks 1-1/2 oz, but by far the bait of choice has been live croakers. Besides linesiders, the redfish bite has remained steady while black drums have made their appearance known over the past week. Live shrimp has been the bait of choice for both. Finally the pompano bite has remained steady over the past 2 weeks and it seems the fish are slowly getting bigger and anglers are having to throw less shorts back into the water. Try a 1/2 oz Doc's Goofy Jig with a teaser quill for a dynamite pompano bait or be sure to stop into the shop for some advice on different rigs and techniques for those fishing for pompano. This morning winds are blowing out of the Southeast at 11 mph and the water is choppy. There are rain clouds over the inlet this morning. The anemometer on the live web cam site is not working properly and we have notified the web cam provider. In the meantime, you can go to the resources link on our home page and click FIT Coastal Engineering Lag then click Real Time Data in the top right corner for wind speed, direction and lots of other stuff that may or may not interest you. On the north jetty yesterday, the morning activity produced some nice bites of Snook, Reds, Jacks, Blues and Ladyfish. The best bite was between 6:00 - 8:30. Around 10:30 the bite slowed significantly although at least one nice Spanish Mackerel came over the rails along with more Ladies and Jacks. Tons of mullet were swimming around the north jetty which can bring in all kinds of species. A huge Redfish caught using pinfish. Although he didn't measure it, Mike estimated it to be between 45" - 50"! Mike reported 4 - 5 slot sized Snook landed by other anglers. Also a nice 24" Spanish Mackerel he landed off the north jetty yesterday using live finger mullet. Inshore, the snook fishing has again began to pop. The south jetty at Ft. Pierce last night was good for snook on live mullet. Flounder were also caught off the south jetty. One angler told me that he has been doing good on snook on the flats with plenty of legal size fish taken on Berkley Gulp. We've got a warm morning on the jetties today. Winds are blowing out of the Southeast at 3 mph and there is a chop on the water. The rougher waters are usually good for catching Snook and the north jetty has quite a few anglers out there this morning. Over the past two days we've seen mostly Black and Red Drum coming over the rails, a 26" Black Drum he landed on the incoming afternoon tide from the north jetty using dead shrimp which he says seems to be their bait of choice, at least for now. There continues to be a lot of bait in the water. A lot of different fish are out there and can be landed in various places. Try fishing the beaches (heavier tackle today), the T-Dock on the south side or the flats. There are usually fish to be found all around the inlet area at this time of year. Yes, I know it still feels like summer; but we are moving into fall fishing patterns on the beach. The mullet schools are still coming down the beach, and with them have come a good number of assorted species. In the mix are the usual fall players; spanish mackerel, king mackerel, bluefish, and even some pompano. I’m going to keep this report short (more details coming in the next few days), no need to waste your time…you should be fishing! Now is a good time to get on the beach. More coming soon. Inshore, there have been reports of redfish scattered around the lagoon and some good numbers concentrated near the Harbor Branch area. Trout fishing has been decent on soft plastics and live shrimp. Snook fishing has slowed a little bit, there have been some caught on the flats and off the south and north jetty both on jigs and live mullet. Winds are blowing out of the Southwest at 1 - 2 mph and the water is churned up this morning. We have rain clouds hovering over the inlet that seem to be keeping most people away as the jetty is not crowded at all. We do have a few die-hard anglers out there and this morning a couple of Black Drum have come over the rails as well as a couple of keeper Reds. No Snook were seen coming over the rails, but we understand the night bite has been ok. Any night anglers out there who can send in an update on the fishing? Ladyfish were coming through like suicide bombers; you couldn't get away from them! Catching three at a time on a Pompano rig. Pomps were out there, you just had to hope a Pompano got to your bait before the Ladies did. Anglers ended up using the Ladyfish for Shark bait and hooking up with a couple of big Sharks. Later in the evening, Jacks and Redfish started biting. Winds are blowing out of the Southwest at 3 mph this morning and there is a pretty good chop on the water. The north jetty is crowded with anglers this morning looking for a nice Snook dinner. Over the weekend, was pretty good, particularly in the morning hours. Anglers landed a good variety of fish.Reports of a good Snook bite in the morning with 6 - 8 keepers caught, a half dozen Black Drum, Mangrove Snapper and Jacks Spadefish and some undersized Pompano. They reported lots of finger mullet in the water. Snook fishing remains very good these days. The mullet are coming down the beach (and filtering inshore) nicely, and the snook have taken notice. Jupiter Inlet, Juno Beach Pier, and all the usual inshore bridges are holding fish right now. Standard drill for the most part; live bait is better during the day (and at night most of the time), try and trick them with the lures at night. If you opt for the lures, keep them looking like a finger or small silver mullet. Good lure choices include Zara Spooks, Rapala X-Raps, Yo-Zuri Crystal Minnows, DOA Baitbusters, and Gulfstream Skimmer Flair Hawk Jigs. Get after the snook before the bluefish show up in force. It was another fun week out on the water. Wonderful weather and lots of exciting action for us. We should continue to have nice conditions for anglers to enjoy the fishing around the Treasure Coast this month. Have some fun soon and get out fishing! Redfish continue to feed on the shallow flats. The fish we have caught have been in the upper slot range and some going up to 30" lately. DOA shrimp, live shrimp or cut baits have all been working at getting a nice sized fish to bite. Fish slowly and move quietly across the flats when looking for the reds. Capt. Joe Ward and myself got to enjoy a play day out on water and found a school of over a hundred redfish in front of us. The trout bite has slowed somewhat this week. Most bites have come in four to six feet of water on DOA shrimp. Things should get back to normal quickly as the water quality improves. It has been murky water around the river and the trout don't usually like those conditions. Snook fishing continues to improve for night anglers and the daytime fishing is also getting better. Jacks are all over the river, inlets and beaches and feeding heavily. A top water lure in the morning can get you in on the fun action with these fish. There have been a few reports of flounder around some of the sand flats and this should only get better as the month goes on. Snapper have been around bridges, docks and channel edges. Live or dead shrimp works great on them. September has been a great fishing month already. As the mullet run continues on the Treasure Coast, get out along the beaches to enjoy the fishing along the surf. Snook, jacks and other predators are out there feeding as the bait schools work their way along the beach. It's a great month to fish! Inshore, waders have been catching redfish and snook on the west side of the lagoon around midway road. This morning the south jetty at Ft. Pierce was producing good catches of black margate and flounder on cut shrimp. The fall mullet run is still in full swing, area beaches are showing anglers a good time with jacks, snook and redfish. The inlet at Ft. Pierce has a few tarpon and some snook action on the south side. The flats have some trout, pompano and permit on them. Berkley gulp has been working there. We have another gorgeous, hot day ahead of us today. Winds are blowing out of the Southwest at 4 mph and there is a light ripple on the water. The Doctors, Lawyers, Weekend Warriors Surf Contest has been moved to Cocoa Beach today due to lack of waves. The contest may be held at the inlet tomorrow depending on the surf. Beware of the jellyfish that are still pretty thick in the water if you head to the inlet today. We got a nice update from Mike on the activity on the north jetty. Mike reported that the Black Drum bite was coming on strong and are actually hitting better than the Red Drum now. Both are taking live and dead shrimp and biting on incoming and outgoing tides. Some of the better anglers are limiting out on Black Drum at 5 per day. The slot for Black Drum is 14" - 24" but an angler may possess one that is larger than 24". A couple of keeper Snook came over the rails in the morning hours and Chuck Fischer of Satellite Beach landed his second keeper of the season while free lining live shrimp on the incoming tide. Jacks, Ladyfish and Atlantic Spadefish were coming over the rails as well. Thanks for the update Mike! Inshore, the beach action remains the hot spot, with the north jetty providing some good action on snook, redfish and jack crevalle. The south jetty last night was good for snook on live mullet and jigs. Mullet have populated the lagoon in a big way and in the inlet as well. We have heard of some good redfish and snook action south around Midway road on the west side from some folks wading there. Trout fishing has been improving over the flats, anglers are finding the best action on soft plastics. For the first time in a while Redfish have made their way to the top of our inshore report. Some big reds have found their way back into the our part of the Indian River with decent sized schools of nice sized fish being reported in the usual places. Try fishing Long Point and Black Point in the early morning while working a DOA CAL Shad #415 Gold Rush Black on a 1/4 oz. jig head. Sea Trout bite has also been steady with some bigger fish being reported the past week on the clam lease. Early morning bite has also been the best with top water action yielding the best results. Once it gets too late in the day the fishing has been shutting off so you might as well wait until the afternoon storms cool the water down. After that the fishing action will pick up again with the fish moving towards cooler water. At the inlet fishing has been slower than usual over the past week. Best catch of the week has been Mangrove Snapper. Best bet for both anglers fishing by boat and off the jetty going after mangrove snappers has been live shrimp on a jig head. Anglers fishing by boat need to fish the ledge in the inlet but please try not to anchor in the channel. Those playing the tides have seen some redfish and snook landed but nothing in great numbers as we should be seeing for this time of year but you can expect that to change at any moment. Most of the trout have come in four to six feet of water this week. DOA shrimp and live bait have accounted for our trout. Redfish can be found moving across many of the flats on the high end of the tides in one to three feet of water. DOA shrimp and live bait has worked well on hooking up with an upper slot redfish. We have found flounder on some of the sandy flats and you can still find plenty of snapper around the channel edges and docks of the river. Snook fishing the bridges and jetties at night has been productive on the first part of the outgoing tide. Feather jigs, Terror Eyz and live bait has been the best choices for anglers. The mullet run going off in the inlets and the bait is flooding into the river. The predators are moving in and the fishing will continue to get better as the fish will be feeding heavily the next few months. It's a great time of year to be fishing! INSHORE - Everyone has been looking for snook and there has been plenty to be found. The only problems is finding one in the slot. Most of the snook reported have been over or under the 28 to 32 inch slot. The hot spots this past week has been the Taylor Creek Spillway, the docks along the Ft. Pierce Inlet and around both the North and South Bridges. The top baits have been croakers, pinfish, pigfish and mullet. A lot of smaller fish were caught on a live shrimp. The trout bite has slowed down a little but the redfish bite remains good. There has been plenty of dirty water to slow things down but the most productive place has been the area down around the Power Plant. Try a live shrimp for the redfish and a pigfish for the trout. There is still plenty of snapper along the channel edges and they are taking small live shrimp. The finger mullet have been everywhere and the flounder will take a small one. The bite was fairly good at the South Jetty over the weekend. It's a beautiful morning at the inlet. Winds are blowing out of the Northwest at 7 - 8 mph and there is a light chop on the water. Yesterday the bite picked up a little from the day before. Black Drum are hitting clams and shrimp, a few Reds came over the rails, some Mangrove Snapper and over and under sized Snook which had to be returned. It's difficult landing one in the slot. Be sure to have a Snook stamp on your fishing license if you are lucky enough to land one in the slot and plan to keep it. The slot is 28" - 32", 1 per person per day for Snook and 18" - 27" for Reds, also one per person per day. This morning winds are blowing out of the Northwest at 13mph which is a welcome change from yesterday, when it was really hot out on the north jetty! The wind has the water churned up and that could be good as long as anglers can keep their lines from getting tangled. In these types of conditions, heavier tackle is recommended. The bite slowed considerably yesterday. The early morning hours provided a few Black Drum, a couple of keeper Reds and a few Mangrove Snapper but it was overall, pretty slow. Glass minnows were swimming around the jetty, a couple of Mackerel were seen zipping by and there were lots of jellyfish in the water. This morning winds are blowing out of the Northwest at 4 mph and there is a nice little ripple on the water. The finger mullet schools thinned out yesterday morning according to anglers. Mike reported a nice Snook and Red bite in the morning hours. Three slot Snook were landed and several were lost due to cut-offs. Most of the Reds are being landed on finger mullet and a few landed on shrimp. Mike landed a slot Red on dead shrimp. Anglers free lining shrimp pulled in some good sized Lookdowns (or Moonfish) and a decent sized Whiting came over the rails in the morning hours. Inshore, we still have snook, trout and redfish cruising the flats, however the full moon is contributing to an all around slow down. One angler reported a good catch of trout on the flats over the week end using a DOA Deadly Combo type rig.Anglers mentioned that a good number of the trout were under sized. We are still hearing good things from the Stuart inlet as far as snook fishing is concerned. Anglers fishing that inlet have been producing good numbers on both artificials and live bait. It's a real pretty morning at the inlet. There is a nice breeze blowing out of the Northwest at 11 mph keeping our jetty anglers a little cooler than it has been. The breeze also helps with the no see 'ems. Thereis a nice chop on the water. We received a couple of updates from Friday and Friday night at the inlet. 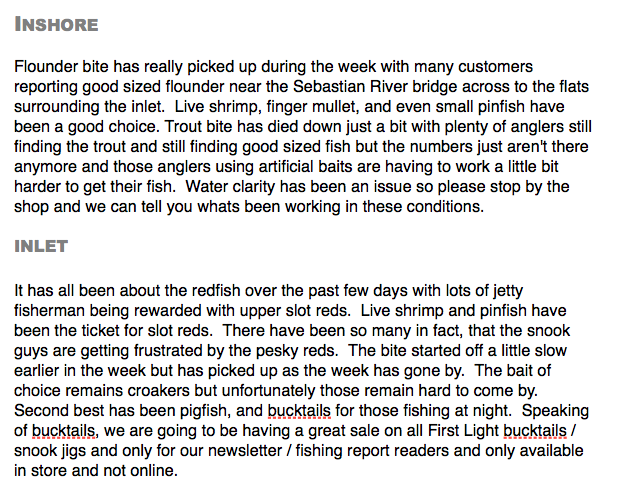 Our first report was from Mike who said Friday morning the Redfish bite was decent. About 8 - 10 slot sized Reds came over the rails along with a few oversized, one of which Mike landed and returned to the water. Most of the Reds were landed on live mullet. Quite a few Jacks in the 3 - 5 lb range came over the rails and several small Pompano were landed and released. Anglers were landing catch and release Reds and Snook although a few keeper Snook were landed. Large schools of Ladyfish were abundant and there were some big predators in the water below them. Anglers, please remember to take your photos on site, we cannot use photos taken in your backyard, garage or living room. Please hold your catch and release photos properly, please use both hands to hold the fish and do not hold a C/R fish by the gill covers. If the fish are slot sized and you are going to eat them, it doesn't matter how you hold them. See the FWCC regulations on the top right corner of this page for more information. 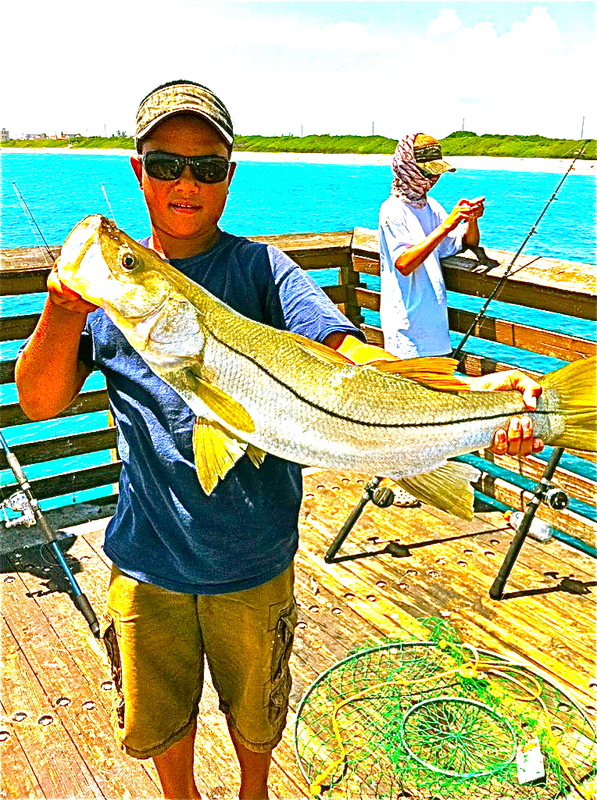 Inshore, Snook fishing at the south jetty at Ft. Pierce inlet was good over the week end. Ft. Pierce's mayor Bob Benton reported catching 5 snook early this morning on a bomber green back wind cheater. Reports of a good day yesterday on the flats north of Ft. Pierce's turning basin. Caughtes of snook, trout and redfish all on artificial baits. A guest of Patrick Sebile of Sebile lures reported on Saturday to us, a catch of 20 snook. Inshore, there are plenty of mullet around the inlet and back in the lagoon and with the mullet you can find ladyfish, jack crevalle, snook and an occasional bluefish. Reports of catching snook in the inlet casting a Yo-Zuri Mag Minnow on the incoming tide yesterday. This can be an exciting time of year for fishing in the lagoon, with all the mullet around there are plenty of predators chasing the mullet schools. You just have to be patient and put your time in to be there when there is a feeding frenzy. Any mullet imitation will provide you with good results. It's a real pretty morning at the inlet. We have a little more wind today; it's blowing out of the South Southwest at 6 mph and there is a light chop on the water. There are some nice waves for the surfers out there, so please use caution when casting into the surfing area. Reports of a lot of undersized Pompano then a freak school of large ones came through and they landed 10 keepers in 30 minutes, then it was back to shorts. The guys fished all day and had a great time landing Jacks, Ladyfish, Bluefish, oversized Reds and one slot Red. Mike on the north jetty again yesterday (he just can't stay away when the fish are biting) and reported more keeper Reds, a few nice Mangrove Snapper and Black Drum this morning using fresh clams. Jacks and Ladyfish were active as well. We've heard that some nice Trout are being pulled out of the Indian River, get out and try some flats fishing! 09-07-11 WEDNESDAY: REDS, MANGROVE SNAPPER, JACKS, SMALL POMPANO AND SNOOK! We have a small reprieve from the heat this morning as there is cloud cover over the inlet. Winds are blowing out of the South at 1 - 2 mph and there is a chop on the water. We have some sets of small waves coming through and there are a lot of surfers on the north side of the north jetty taking advantage. Please use caution when casting off the north side of the north jetty; we want to keep our surfers intact. An update from Mike that yesterday the Red bite was good in the morning from 6:30 - 8:00 and slowed until around 10:00 a.m. Mike reported the tide was outgoing the entire time he was on the north jetty from 6:30 - 11:30 a.m. A few keeper Reds were landed, Mike got one at 25" using live pigfish, and others were landed on live mullet and live shrimp. A few Mangrove Snapper came over the rails as well but the most exciting catch of the morning was a 31 1/2" Snook landed on a live croaker. Inshore, with the mullet run in full swing the snook, jacks, tarpon, and bluefish are wreaking havoc on the mullet schools along the beaches and in the inlet. Redfish have been reported in the lagoon in good numbers but the trout fishing has seemed to taper off a bit. The redfish have been hitting on a copper flats intruder spoons and Mister Twister Exudes. MELBOURNE BEACH – The Florida Department of Environmental Protection’s (DEP) Sebastian Inlet State Park, in partnership with the Friends of Sebastian Inlet State Park, Inc., will host author, photojournalist, and expert angler Captain Rodney Smith at the Sebastian Inlet State Park Fishing Museum in celebration of September being Literacy Month. Rodney will share stories, fishing tips and advice, and sign copies of his books Catching Made Easy and Enjoying Life on the Indian River Lagoon Coast. Captain Smith has also produced two surf fishing guides/maps to north and south Brevard County. Rodney is a Florida native and conservation advocate. He is publisher of Coastal Angler Magazine and has enjoyed life along Florida’s Space Coast, where he has always been eager to share his lifetime of knowledge, skills, and advice on fishing, gardening, and conserving the things that he loves. Copies of Rodney’s books and surf fishing guides will be available for sale in the Fishing Museum giftshop.